Curry comes in multiple forms, not just from Thailand and India. This curry is Japanese and a bit sweeter than its cousins. The author suggests that you use your own spice blend instead of a store bought one to control the taste and give it a richer flavor, even toasting them a bit to bring out those aromatics. This will build even more when fried in oil before adding to the stew, a delicious combo of chicken, onion, carrots, potatoes and garnished with sweet apples to give it texture and more sweetness. 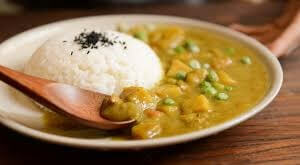 Japanese curry is a very popular comfort food in Japan. You need a spice grinder and a dutch oven to make this recipe. You need a good amount of ingredients in order to make the curry.